Luke Krahe race reviews, notes and blackbookers from Saturday's Melbourne metro meeting at Ballarat. Blackbookers: WRITTEN IN STONE. Race 2. Race 1: Sam Miranda Mares BM78 1200m. BRUGAL REWARD (1st) gets all the praise for her win after sitting three wide without cover throughout. She loomed up at the top of the straight, seemed to switch off a little and was wayward when she found the front, before the rider balanced her up over the last 100m and she really ran through the line well. Notes: ROYAL FASHION (2nd) showed speed before taking a sit, she was held-up at the top of the straight when the winner was sweeping wide but when she got the inside run and loomed at the furlong, she wasn’t able to run past the winner on the inside. SOHO RUBY (3rd) found the line well out wide from well back after following the winner at the top of the straight. Race 2: Isuzu Ballarat BM70 Hcp 1100m. VIA BALCIANO (1st) got a start as an emergency and although giving them a big start, loved the way he got to the line over the last furlong. The speed was genuine and the run-on horses had every chance, clearly doing the best late. Notes: WRITTEN IN STONE (unplaced) had no luck the entire straight. After jostling early when the runs were coming, he continued to find dead-ends towards the inside and although beaten 3 lengths, he went to the line relatively untested. EL RADA (3rd) was the horse jostling with him early in the straight and also did a good job late after finding gaps between runners. Race 3: No Fuss Event Hire BM78 Hcp 2300m. Notes: 0.6 lengths separated the placegetters in a stirring finish, the gapped the rest of the field, needing to go another 5 lengths back to find the fourth horse across the line. All three were up on the speed, ETAH JAMES (1st) was clearly the best late after having the soft run, but it was hard not to be impressed with CEDAR GRANDE’s (3rd) performance. The Mare was three-wide the entire trip, had the audacity to run to the front early in the straight and was only nabbed late when tiring on the line. TIGER TIM (2nd) looked gone at the top of the straight after leading but fought on well once paced to be right in the finish. Race 4: Magic Millions 2YO Clockwise Classic 1000m. LA POMME DE PIN (1st) jumped brilliantly, was clear for most of the race and simply put it, was too fast for them. Handled the clockwise way of going with ease and was most impressive. Raw speed throughout. She showed that same speed on debut and only got nailed late, she looks to have come on from that and with that raw ability, looks to have a future. Notes: No excuses for the beaten brigade. Not in the same league as the winner. Race 5: Hertz Ballarat VOBIS Gold Eureka Stockade 1400m. Notes: Plenty of speed early with as many as four runners trying to lead over the first couple of furlongs. TEZLAH (1st) sat back 2nd last while the speed was on, MACTIER (2nd) was last and CAPTAIN HARRY (3rd) was also at the rear. MACTIER was probably the one that was a little unlucky in the straight after being bumped a couple of times, before getting into the clear and really flashed over the last 75m. Race 6: Suez McKellar Mile 1600m. ROYAL ACE (1st) was only labouring early in the straight and never really looked like winning until picking up over the last furlong, may have handled the conditions better than the rest. 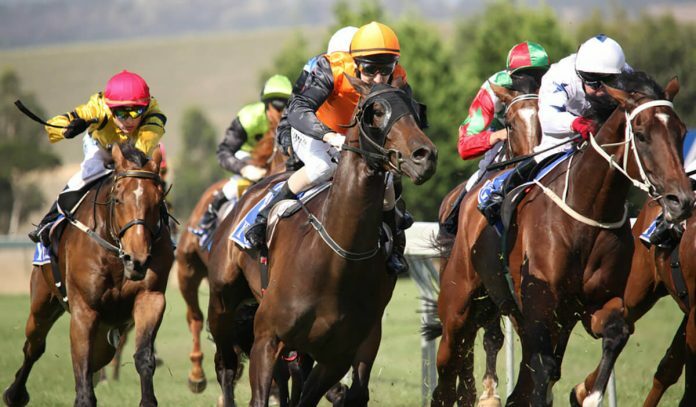 Notes: MOUNT PANORAMA (2nd) ran on strongly from the back and would have traded at a low price in the run but looked to just peak at the end of the mile. SIGA LA VICA (3rd) was the best of the on pace runners. Race 7: Maxitrans BM84 Hcp 1400m. Notes: OZI CHOICE (2nd) ran them along in this and set-up a 3 length margin throughout. The jock tried to get a breather approaching the straight, but once again kicked at the top of the lane and tried to pinch it. He stuck on well going head to head with the winner NEW UNIVERSE (1st) who had a much better run in transit. He tracked into and ran to the leader early in the straight and they came right away. Tough effort to stick on so well on the second horse, none of the other on-pacers were sighted in the finish. Race 8: Sportsbet Ballarat Cup 2200m. Notes: The pace was on from the start in the Cup, BIG BLUE (unplaced) set a cracking tempo after crossing from out very wide and just continued to run them along. He had at least 10 lengths on the second horse mid-race, the early effort telling with him being beaten 23 lengths. MR GARCIA (unplaced) was having his first run for Weir but was forced to chase to hard and was a little disappointing after a good win during the Flemington carnival. He may not have stayed the trip as well as the others. GRAND DREAMER (1st) sat back near last before making its move approaching the straight. They came wide away from the rail and he was clearly the best staying performance. ONCIDIUM RULER (2nd) saved ground approaching the straight and got underneath the leader to briefly take over, but was not match for the winner late. DE LITTLE ENGINE (unplaced) was an eye-catcher, flashed home late to just miss the placings after not being in the picture early in the straight. Race 9: Magic Millions 3&4yo Classic 1100m. Notes: The outstanding Melbourne Spring continued for Waterhouse and Bott with the win of DEBONAIRLY (1st). The filly sat up outside the leader, they all stayed well away from the fence into the straight and she was clearly travelling the best. DIVINE QUALITY (2nd) was the heavily supported favourite, had a soft run before gaining ground beneath runners into the straight but looked to have every chance, may just have not been wide enough on the track but the winner was going better late. SENOR GAUDI (3rd) continued the great day for the Kennewell stable. Race 10: City of Ballarat Tonks Plate 1200m. Notes: It seemed by the last it was a case of the wider the better. The speed was ok but they were bunched coming to the turn, and none of the on-pacers were there at the finish. Not sure that there is anything worth following and that the track may have been the contributing factor to the results. The first two across the line came wide and ran on hard.